20:1.10Melchizedeks are the joint offspring of a local universe Creator Son, Creative Spirit, and Father Melchizedek. Both Vorondadeks and Lanonandeks are brought into being by a Creator Son and his Creative Spirit associate. Vorondadeks are best known as the Most Highs, the Constellation Fathers; Lanonandeks as System Sovereigns and as Planetary Princes. The threefold order of Life Carriers is brought into being by a Creator Son and Creative Spirit associated with one of the three Ancients of Days of the superuniverse of jurisdiction. But the natures and activities of these Local Universe Sons of God are more properly portrayed in those papers dealing with the affairs of the local creations. 20:1.12 As the Paradise orders of Days proved to be divine administrators, so have the orders of Paradise Sons revealed themselves as divine ministers—creators, servers, bestowers, judges, teachers, and truth revealers. They range the universe of universes from the shores of the eternal Isle to the inhabited worlds of time and space, performing manifold services in the central and superuniverses not disclosed in these narratives. They are variously organized, dependent on the nature and whereabouts of their service, but in a local universe both Magisterial and Teacher Sons serve under the direction of the Creator Son who presides over that domain. 1. Judicial Actions. They act at the close of the planetary dispensations. In time, scores—hundreds—of such missions may be executed on each individual world, and they may go to the same or to other worlds times without number as dispensation terminators, liberators of the sleeping survivors. 20:2.9 In all their work for and on the inhabited worlds, the Magisterial Sons are assisted by two orders of local universe creatures, the Melchizedeks and the archangels while on bestowal missions they are also accompanied by the Brilliant Evening Stars, likewise of origin in the local creations. 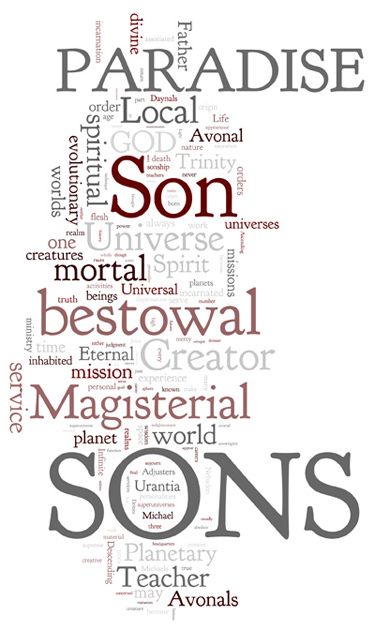 In every planetary effort the secondary Paradise Sons, the Avonals, are supported by the full power and authority of a primary Paradise Son, the Creator Son of their local universe of service. To all intents and purposes their work on the inhabited spheres is just as effective and acceptable as would have been the service of a Creator Son upon such worlds of mortal habitation. 20:3.3 The arrival of a Paradise Avonal on an evolutionary world for the purpose of terminating a dispensation and of inaugurating a new era of planetary progression is not necessarily either a magisterial mission or a bestowal mission. Magisterial missions sometimes, and bestowal missions always, are incarnations; that is, on such assignments the Avonals serve on a planet in material form—literally. Their other visits are “technical,” and in this capacity an Avonal is not incarnated for planetary service. If a Magisterial Son comes solely as a dispensational adjudicator, he arrives on a planet as a spiritual being, invisible to the material creatures of the realm. Such technical visits occur repeatedly in the long history of an inhabited world. 20:4.5 Urantia may yet be visited by an Avonal commissioned to incarnate on a magisterial mission, but regarding the future appearance of Paradise Sons, not even “the angels in heaven know the time or manner of such visitations,” for a Michael-bestowal world becomes the individual and personal ward of a Master Son and, as such, is wholly subject to his own plans and rulings. And with your world, this is further complicated by Michael’s promise to return. Regardless of the misunderstandings about the Urantian sojourn of Michael of Nebadon, one thing is certainly authentic—his promise to come back to your world. In view of this prospect, only time can reveal the future order of the visitations of the Paradise Sons of God on Urantia. 20:9.5 The Trinity Teacher Sons seem to be so completely identified with the regime of mortal progression through the earlier stages of evolutionaryascension that we are often led to speculate regarding their possible association with the finaliters in the undisclosed career of the future universes. We observe that the administrators of the superuniverses are part Trinity-origin personalities and part Trinity-embraced ascendant evolutionary creatures. We firmly believe that the Teacher Sons and the finaliters are now engaged in acquiring the experience of time-association which may be the preliminary training to prepare them for close association in some unrevealed future destiny. On Uversa it is our belief that, when the superuniverses are finally settled in light and life, these Paradise Teacher Sons, who have become so thoroughly familiar with the problems of evolutionary worlds and have been so long associated with the career of evolutionary mortals, will probably be transferred to eternal association with the Paradise Corps of the Finality.